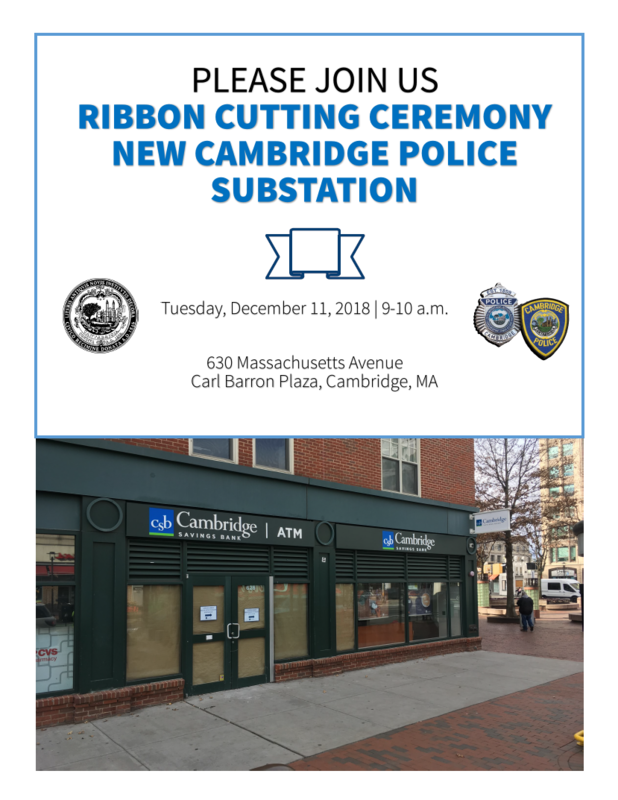 The City of Cambridge and Cambridge Police Department invite Cambridge residents, business owners and community members to join City Manager Louis DePasquale, Police Commissioner Branville Bard, Jr. and distinguished guests for a special dedication and ribbon cutting ceremony on Tuesday, December 11 at 9 a.m. to officially announce the opening of the new Cambridge Police Central Square Substation, which will be located next to Cambridge Savings Bank at 628 Massachusetts Avenue. A speaking presentation will be held at Carl Barron Plaza followed by a ribbon cutting ceremony in front of the new substation. Speakers will include City Manager Louis DePasquale, Police Commissioner Branville Bard, Jr., Wayne Patenaude, President and Chief Executive Officer of Cambridge Savings Bank, and Central Square Business Association Executive Director Michael Monestime. In July 2018, the City of Cambridge announced it had signed an eight-year sublease with Cambridge Savings Bank to enable the Substation for the Cambridge Police Department in Central Square. The new Central Square Substation will hold a small lobby, desk space for a computer, and storage space for patrol bicycles. Department signage and a police callbox will be featured outside of the station.